Just seven short years ago “responsive” design entered our lexicon via web designer Ethan Marcotte. He observed that the web functions as a supreme disrupter making transience and inconsistency a normal state of affairs. We’ve had to adjust for a plethora of screen sizes, tech advances, operating systems, and user preferences. As a result, responsiveness has become mandatory; we are permanently at the edge of another digital footprint and mobile is leading the way. By 2018, 80% of email users will access their email accounts via a mobile device (The Radicati Group “Email Statistics Report, 2014-2018”). 1. Use Simplicity. Be concise and economical with content and design. Use fonts like Helvetica, Arial, Trebuchet MS, or Verdana. These fonts render correctly across multiple platforms and guarantee most people will see the page correctly. Your email should also mimic the design aesthetic of your website and include your logo – that’s a surefire way to build brand. Make sure your logo or header clicks back to your website or landing page. 2. Be Specific. Get to the point. People using an iPhone 5SE, for instance, have a very small window. Distill your content into a precise message and let subscribers visit your website for more in depth information. 3. Have a Call to Action [CTA]. Make the CTA visible and near the top of the newsletter. This increases the changes that subscribers will visit your landing page. To avoid misclicks, leave enough white space around the CTA and make the CTA button at least 44 pixels wide. 4. Don’t forget to optimize your preheader text. 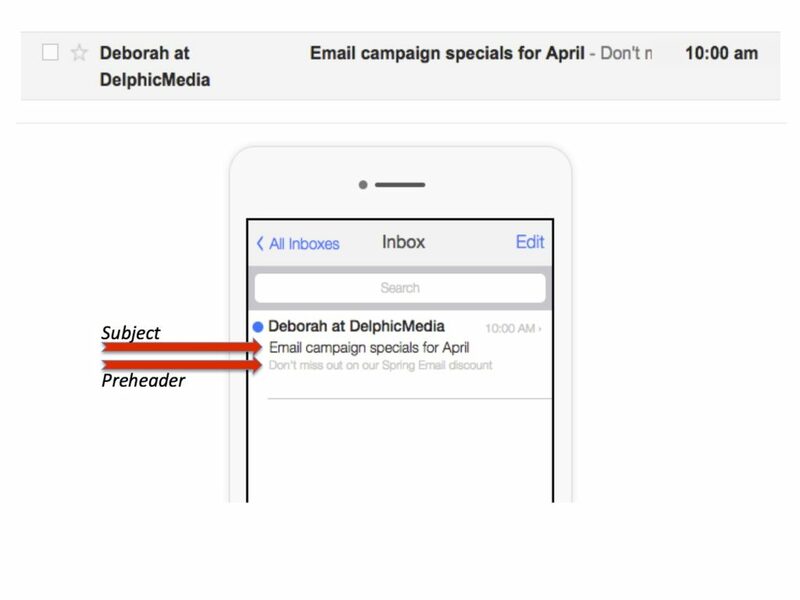 The preheader is the short summary text directly following the subject line when an email is viewed. It is automatically pulled from the first 75-100 characters of your email copy and displayed underneath the sender name and subject line in a subscriber’s inbox. In desktop email clients this would be called the “preview pane”. If you don’t add preheader text, make sure the first thing a reader sees is a compelling message. The one thing you don’t want subscribers to see is, “Having trouble viewing this email?” To avoid the automatic display of administrative content, make the first lines of copy concise. It can mean the difference between someone engaging with your brand and deleting your email. 5. Use columns sparingly. To ensure your email displays across mobile devices, opt for two columns maximum. Using more will stack and squish on mobile displays. 6. Use correct HTML and templates. Your email service provider will have a complement of responsive email templates that you’ll be able to modify. 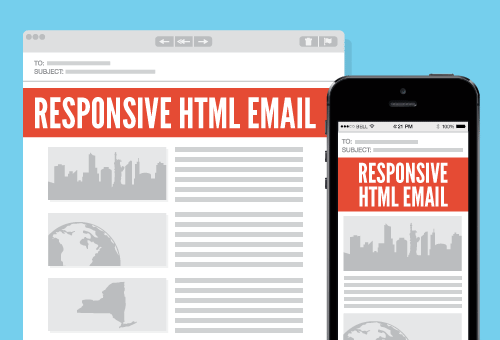 LITMUS provides a free download of responsive email templates available below. Build your email list by providing relevant content that people want to share. How to accomplish that? Segment your lists and send targeted messages. Never send a blanket email to all subscribers. Your clients will be at different stages of their journey and will respond to appropriate messages sent at the right time. Incentivize your subscribers by sending specific and targeted information. Just sold a cloud computing service? Why not forward a white paper to that client explaining how to manage server settings? Chances are they’ll forward that to a friend or colleague who is still shopping for cloud computing. 1. Design Different Opt-ins for Each List. 2. Create triggered messages to immediately respond to subscriber behaviors, particularly purchase cycle and buying frequency. 4. Have Facebook posts, tweets, and emails, pre-populated with content. Then all you are asking the reader to do is click. Make it easy for subscribers to share. 5. Use a dedicated “Forward to a Friend” call to action. More than 50% of people view their email on a mobile device so you may want to dedicate a specific section to a prompt that asks users to “share content”. You also want content to be as focused and relevant as possible. Don’t forget that recent service updates, account changes, whitepapers, and events can all be used to reach out to targeted subscribers. Your goal is to let subscribers know about your value without spamming them with unnecessary information. Segmentation accomplishes this task.